With the increase in military veterans returning with Post-Traumatic Stress Disorder (PTSD), in 2018 Canine Companions launched a pilot program to directly place service dogs with veterans with PTSD. Currently, eligible participants must live within a 200-mile radius of our regional training centers in Santa Rosa, California, Medford, New York, and Irving, Texas. Dogs are trained in tasks including anxiety and nightmare interruption, turning on lights, retrieving items, and supporting their handler in crowded public situations that might provoke anxiety for individuals with PTSD. In the future, we hope to expand this new placement type to include first responders with PTSD. The criteria for participation in this program include living within 200-miles of Santa Rosa, California, Medford, New York, or Irving, Texas, and veteran status. At this time, Canine Companions does not train dogs to work with individuals who desire support for PTSD outside of the context of the program. 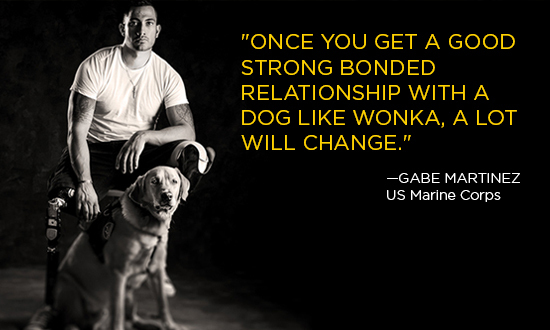 Canine Companions for Independence has provided many assistance dogs to US war veterans across the country. With the increase in wounded veterans who could benefit from an assistance dog, we want to do more. For a veteran making a new start putting their life back together from an injury, an assistance dog can provide the help they need to regain independence. 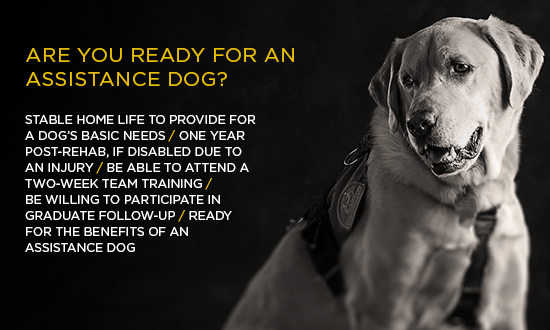 Canine Companions recognizes the urgent and growing need for programs that provide support to veterans with disabilities. Many of the brave men and women returning home from combat with disabling injuries experience a litany of new challenges. Often, they face difficult transitions back to civilian life as well as uncertain futures with new disabilities. Canine Companions assistance dogs can help veterans regain independence, pride and hope. Beyond much-needed physical assistance, the love, loyalty and positivity of a canine partner can make a profound, lasting impact on someone dealing with difficult emotions that are hard to communicate. Canine Companions was the first assistance dog organization to be accredited by Assistance Dogs International, and has provided assistance dogs to over 6,000 people with disabilities. Questions? Please contact us at 1-800-572-BARK (2275) or via email.